Born With Makes VOYA Magazine Top Shelf List for 2016! 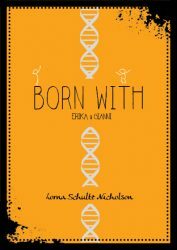 Lorna is pleased to announce that Born With has made the VOYA Magazine Top of the Top Shelf for middle school readers list for 2016. VOYA chooses books that reflect the complexities and challenges that middle school attendees face. Based on reviews from their panel and teen readers, Born With has made the top 5 on the “Challenges” list. For more information, please check out the Top Shelf for Middle School article.